What was I Scared of? – Dr. Seuss is another must have treasure! 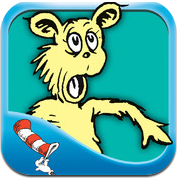 This is a great book app for anytime of the year. It is playfully spooky for Halloween yet loaded with powerful life lessons on fear and understanding things that are different. Kids will definitely benefit from the message and the colorful and clear delivery. There is a task to be done and a “scary” pair of pants keeps showing up. Soon it is clear that the pants have feelings too – Great job on this app! You can also record your own voice using the bottom left icon and share with your friends! This app is presented to us by Oceanhouse Media. Can You Guess The Lesson?